Swans referred as scalable wireless network simulator which works on Jist platform. We offer Swans simulator projects primarily on their performance which serve as a validation of virtual machine based approach to simulator construction. We offer SWANS simulator IEEE final year projects composed of independent software components to form sensor network configuration. SWANS can perform for large network and simulate like NS2, GloMoSim. We supported and have deployed swans in more than 75+ projects which leverage Jist design to attain high simulation throughput, Run java network application over simulated networks and save memory.Swans developed by the combination of DaSSF and BBNs wirokit. These are easily combined and ensure high interoperability. 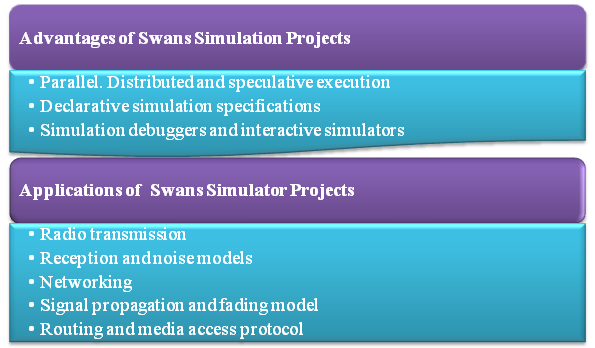 We implement various models of swans in student’s projects and there are described as follows. Terrain Model: We use this model which is a static map serve unify point among plume dispersion and RF channel model. Plume Dispersion Model: It drives the wireless sensor by ensuring the input. In the model, network design can be automatically validated when compared with evolution of plume model against sensed plume. Node model: A node model used to represent smart sensors which denote entities with physical smart sensor devices. RF Channel Model: It is the more complex model and provides direct influence on result of network simulation. To form sensor network we ensemble object in each node for GPS, monitor, IP, Router, MAC, and PHY. GPS (Global Position System):It ensures current time and location information. It synchronizes information. It synchronizes information in all nodes. Monitor:It referred as data link for message from sensor. IP:Ensure datagram header for each sensor message. Router:Associate with ad hoc network to forward engine. MAC:It denoted as unique link layer protocol which arbitrate multi node access to shared RF channel. PHY:Simulate physical layer to provide channel encoding, modulation and interference effects. We implement swans advantage which integrated from Jist and java platform. Simulation debuggers and interactive simulators. Parallel, distributed and speculative execution. Signal Propagation and Fading Models. Routing and Media Access Protocols.